In the Cypress Hills, just 13 kilometres from Eastend, lies Pine Cree Regional Park. 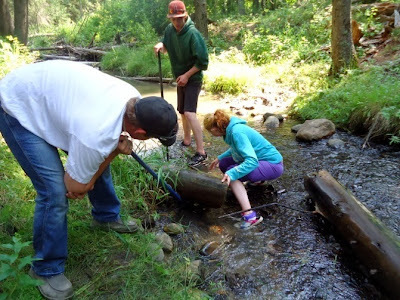 It’s a small, natural park featuring “old time quiet starry nights, watchable wildlife, wildflowers galore, fishing, and hiking.” Swift Current Creek runs through the site, providing clear, cold running water all year long. The park was initially developed by Everett Baker, a Saskatchewan naturalist, historian, and photographer. In 1970, Pine Cree became a regional park, commemorating the memory of Everett Baker and John Macoun, a member of the Canadian Geological Survey who camped in the area in the 1880s. There are three self-guided trails through the park that can be booked through the park officer. One trail takes you up to the highest point in the park where you will discover teepee rings, while another leads you up above the Hermit’s Cave. All three trails are described in Robin and Arlene Karpan’s book, Saskatchewan’s Best Hikes and Nature Walks. 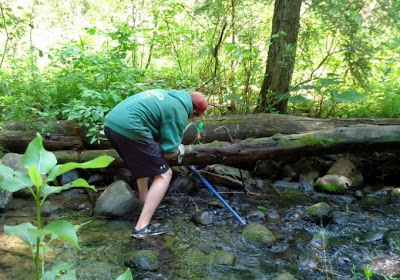 In June, the park applied for an EcoFriendly Action Grant to help clean up a portion of the creek. A 1980s fish enhancement project had used long spikes and stems of rebar to attach treated timber and long planks to the banks of the creek. Over time, the timber and planks had worked loose, causing jamming and bank destruction and exposing pointed segments of rebar. Darcy spent 40 hours on the project and was helped on his last day by Riley, a volunteer, and Ashley, a staff person. Brittney Hoemsen, TRoutreach Saskatchewan’s Project Coordinator, is very familiar with the park. She says, “It's an amazing park. We started sampling it only because it was so pretty there but what we found kept us coming back! It's a small creek with cold (around 4 degrees average all year), clear running water, which is fairly rare in Saskatchewan. It therefore supports many insects that aren't found anywhere else! We found a new species of midge (Odontomesa fulva) that isn't found anywhere else in Saskatchewan. We also found a caddisfly family, Neophylax splendens, which is new to Saskatchewan.